The future NBA Draft lottery pick overcame a sluggish first half to lead the Blue Devils to a comeback victory. According to Syracuse head coach Jim Boeheim, Jahlil Okafor will be the No. 1 pick in the upcoming NBA Draft should he declare. But before embarking to the professional ranks, the star freshman showed a record-tying 35,446 fans on Saturday evening why he merits such high praise. Okafor bolstered his résumé for ACC Player of the Year by pouring in 23 points and 13 rebounds to help No. 4 Duke rally for a hard-fought 80-72 victory over the Orange in the Carrier Dome. The Duke Blue Devils picked up the pace against the Syracuse Orange in the second half of the Valentine’s Day game, edging out an 80-72 win. With Duke (22-3, 9-3 Atlantic Coast) facing a three-point deficit out of the half, Okafor immediately swung momentum by hammering down a dunk in the opening minute of play. He quickly added six more points, including another slam with 15:33 remaining to give the Blue Devils an eight-point lead. His final throwdown with 1:58 remaining allowed Duke to cruise to the finish with 10 free throws in the final minute of play as Syracuse fouled in desperation. Perhaps even more impressive was Okafor’s defense against SU big man Rakeem Christmas, who shot only 5-of-17 from the floor and posted his third-lowest scoring total of the season (11). While Christmas had plenty of opportunities to post up around the rim, quick footwork and great court awareness by the six-foot-11-inch freshman backed him up just enough to prevent his shots from falling. 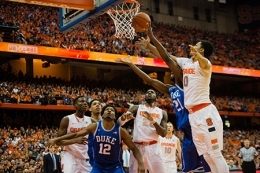 But before Okafor could rally the Blue Devils, Michael Gbinije put on a show against his former team in the first half. The junior made five shots from beyond the arc, three of which came during a 1:49 stretch that gave the Orange (16-9, 7-5 Atlantic Coast) what seemed like a significant nine-point advantage. With one final jump shot during the final two minutes, the junior raised his period total to 19 points, more than doubling every other SU player before the break. Gbinije stalled in the second half after Duke charged Quinn Cook with covering him, but he still finished with a career-high 27 points. The Orange tried to mount a comeback and did cut its deficit to four points late in the game, but ice-cold perimeter shooting eliminated the potential for a game-changing shot. Trevor Cooney made one final three in garbage time, which was the only SU conversion scattered among 10 misses in the latter period. Cooney has shot an ineffective 26 percent from deep over his last five games. That forced Syracuse to attack inside, where Tyler Roberson took advantage of a double-teamed Christmas to score 19 points and earn his first double-double since SU’s loss to Miami on Jan. 24. Cook added 17 points for Duke, which has now won five straight ACC games. The senior also extended his streak of consecutive games with a three-point conversion to 35, tops in the ACC. Both squads have rivalry games looming this week. Duke will play bitter nemesis North Carolina on Wednesday, the same night SU welcomes former Big East foe Louisville to the Carrier Dome for the first of its three final home games. Boeheim said it would have been nice to come away with an upset victory before the tough home stretch of conference play, but his team’s inexperience and Okafor’s dominance were just too much to overcome.